I don’t do horror films. Mainly because of two reasons. I honestly think they are sometimes actually just bad films, and two – I am easily scared. Like, I can’t watch the trailer for the new Paranormal Activity film because it freaks me out too much, scared! Even so the films are always beautiful, with fantastic actors, and a lot of the time contain Doug Jones, who comes across as the loveliest man you will ever meet in interviews and on social media, but becomes the stuff nightmares are made of on film. Case and point Crimson Peak. Walking into the cinema I was already quite tense, I had my peppermint mocha and some Halloween candy from the states. I was ready. The trailers already got my heart going. That flipping Paranormal Activity trailer, and a horror film about CHRISTMAS ffs! Is it really necessary? I suppose I better add them to the list. BTW – kinda maybe teensy spoilers ahead…. approach with caution…. Set in Buffalo, New York, the story follows a young aspiring author called Edith Cushing (played by Mia Wasikowska) a likable and very honest character who, though totally against romance, eventually gets swept off her feet by the very persuasive Sir Thomas Sharpe, played by Tom Hiddleston. Who may or may not have ulterior motives. As the story moves over to England we get to learn all about Sir Thomas and his sister Lady Lucille Sharpe, played by the haunting (hehe) Jessica Chastain. 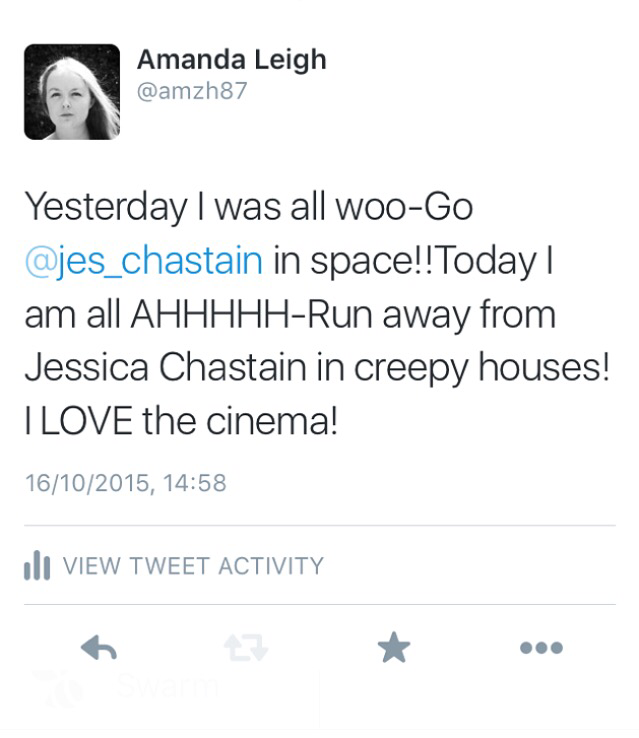 As this tweet I sent after seeing the film yesterday says – I both love and fear Jessica Chastain. Once we are settled in the creepiest house known to mankind, the action really begins to kick off, and what you think is going to be your typical ghost story slowly turns into something much more sinister, till even I couldn’t tear my eyes away from the screen to hide behind my scarf. I really don’t want to spoil anything for you, there are so many intricate in’s and out’s in this story that you really need to see for yourself. You really get a feel for each character and the era the film is set, with Charlie Hunnam’s Dr Alan McMichael character bringing a refreshing lightness against the darkness of the Sharpes and the house they live in. A beautiful sweeping score by Fernando Velázquez really carried the film, building momentum and then dropping out in all the right moments. I love discovering new composers, and I can’t wait to add him to my Spotify playlist. Crimson Peak is a seamless blend of romance and horror that in the end, bar a few moments didn’t really scare me. So all in all I would give this film a solid 5/5, and a scare factor of three…..somethings, mainly for the jump factor. I am going to have to come up with a rating system for scare factor, as I can tell that the score is only going to go up! Does anyone have any horror recommendations old or new that I can torture myself with for this blog? Leave them in the comments below! Previous Post Autumn Days Are Here Again…. Next Post How to Queue Jump at Starbucks and Not Feel Guilty!